It's a carbon copy of the last episode, but anything prominently featuring Tai and TK hitting on a cute French girl is a winner in my book. Plus TK's grandparents are infinitely more badass than Michael's dad. Yes, that includes TK's grandmother, never seen but clearly the only woman in the world qualified to be Hiroaki Ishida's mother-in-law. For all the hesitation and repressed feelings they may have over Sora and Kari, it's awesome to see Tai and TK stumbling over each other trying to get closer to Catherine. 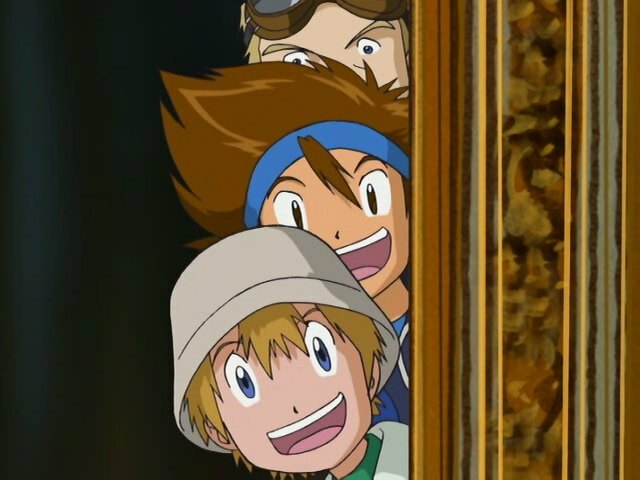 Tai and TK see her in a precarious spot, held captive by three ill-mannered Digimon, yet their faces light up and think “score!” Once the battle's over, they even kiss her on the cheek, pretending it's some sort of French custom. Funny how this global mission to save the world is looking more and more like spring break. And we haven't even gotten to Mexico. The France segment is about all the World Tour arc strives for- an entertaining way to let the characters breathe a little in a new setting, with a bunch of goofy adventures, some cultural mishaps and maybe a cute girl or two. It doesn't add anything to the plot, but it's silly and fun and Tai and TK were due some action with the ladies. It's terrible placement to put these episodes right as the final arc is kicking into gear (by this point in Adventure, the Dark Masters arc had begun) and the reasoning is flimsy beyond belief, but there's too much fun to be had to criticize it too much. The existence of these international digidestined is still very bothersome, with several potential minefields. The biggest, of course, is the inability for these digidestined to open gates. You'd think that was some sort of prerequisite. How else would they know they were digidestined? Were they all pulled in at one point and had some crazy adventure that gave them all important bonding time with their Digimon, yet somehow had no newsworthy impact on the Digital World? Furthermore, if they can't open gates, how did their Digimon get to them in the real world? 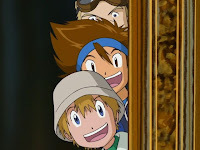 Were all of their Digimon camping near gates, waiting for Arukenimon to open them for her chaotic interests and popping on through to see their partners again? It's not like Catherine has been walking around the real world with Floramon this whole time. There's probably great answers for all of these, but there is absolutely no insight to what has to be some fascinating stories. We shouldn't assume that Joe and Cody are going to make for an inherently boring experience, but it's not encouraging when Ikkakumon and Digmon have to provide the silliness quota. 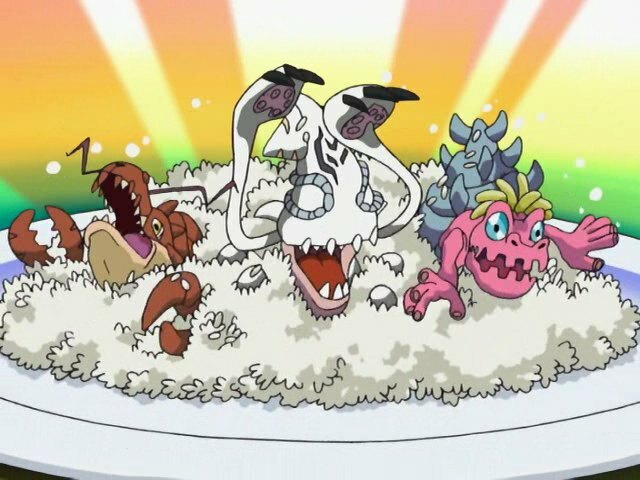 They do so in their unique handling of three hostile Digimon, threatening to turn them into various seafood platters. This scares them into going to the roundup location. Let it be said that making the Great Barrier Reef, a fragile ecosystem unlike anything else in the world, the site of a gathering place for several large and dangerous monsters is really, really stupid. They realize that quickly when a Scorpiomon cops an attitude and Zudomon has to take care of it. At least the Ultimates were useful this time. Although it's worth noting that episode 41 of last season also featured a Scorpiomon/Zudomon fight. At least Joe didn't set anybody on fire this time around. 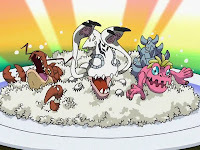 In Japan, the control spires prevented the Digimon from evolving, yet Gomamon, Agumon and Patamon all do it just fine in Australia and France. Not only did Hogan suddenly get younger when he pulled the Santa Claus mask off, he also got skinnier. It's a neat trick! When introducing himself to Derek, Joe refers to himself and Cody as 'the A-team.' I'll avoid the classic television reference and just say that it's laughable that Joe considers himself a first-stringer. He barely considered himself a first-stringer in season one. Cody's close enough, I guess. We didn't see how Izzy and Kari got from Hong Kong to the India border, and that's probably a good thing. This episode has Joe, Cody, Derek and Hogan traveling from Gold Coast to the Great Barrier Reef, a distance of several hundred miles, on a little Zodiac. One of the anonymous Australian digidestined had a Bukamon partner. Other than the Poi Brothers, it's the first time anybody's been paired with the same Digimon as another character. Wonder what that kid's conversation with Joe was like afterward. So Derek was sailboarding, then crossing massive swaths of ocean on a Zodiac, then leading his Crabmon into battle... and he had his laptop the whole time? We never meet French Gennai, but is there any doubt his name would have been either Jacques or Maurice? The French segment was just plain weird in my opinion, what withTai and TK going loco over a girl they met two seconds ago, Davis would have been a better idea, give him someone to stalk besides Kari. To Anonymous above, just imagine how interesting it would have been if he was with Ken and that Rosa girl tried to make a move on Ken. Now THAT would be an episode to remember.